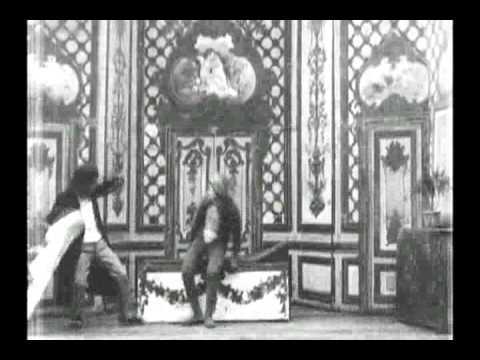 This short by Alice Guy has much in common with “At the Hypnotist’s,” which appears to have been shot on the same set, possibly using the same actors. But, it can also be seen as a remake of “The Vanishing Lady” by Georges Méliès, released two years before. A lady and a man enter a well appointed room and walk around a couch to bow to the audience. The lady is dressed in typical demure 19th Century French middle-class clothing and the man has long hair and a long black coat on. The man gestures and the lady lies on the couch. He approaches her with a sheet and waves it. Suddenly, she is turned into a ridiculously phony-looking monkey. The monkey hops about a little, but is soon coaxed back onto the couch and the magician again gestures. Now monkey and couch are gone, replaced by a large crate. He gestures to make the crate disappear, then makes the woman, standing, appear at his side. He waves again to banish her and bows once more, seeming to depart the stage. Suddenly, he and the lady stand side by side, bowing repeatedly. This is another “trick film,” done reasonably well but without either the artful backdrops or the technical wizardry of Méliès. The one truly original aspect is the monkey (substituting for the more horrific element of a skeleton), and I must comment that it is represented by possibly the worst monkey costume I have ever seen. The movie is light and enjoyable, but undeniably unoriginal. I would assume that it was shot back-to-back with “At the Hypnotist’s,” although the camera remains too far from the actors to allow for facial recognition.